Before Christine “Lady Bird” McPherson (Saoirse Ronan)—Lady Bird is her given name, as in “[she] gave it to [her]self”—auditions for the school musical, she watches a young man belting the final notes to “Being Alive” from Stephen Sondheim’s Company. A few moments before, while in a car with her mother, she lays her head on the window wistfully and says with a sigh, “I wish I could just live through something.” Stuck in Sacramento, where she thinks there’s there’s nothing to be offered her yet she pays acute attention to everything her home does have to offer, Lady Bird—and the film, written and directed by Greta Gerwig, that shares her name—has ambivalence running through her veins. What a perfect match: Stephen Sondheim and Greta Gerwig. Michael Schulman wrote in The New Yorker, “No one in musical theatre does ambivalence like Sondheim, and usually no one tells you what it is until after you’ve experienced it.” Few filmmakers are able to capture the same kind of ambiguity and mixed feelings that involve the refusal to make up one’s mind: look to 35-year-old Bobby impulsively wanting to marry a friend, but keeps him from committing to any of his girlfriends, in Company; the “hemming and hawing” of Cinderella on the, ahem, steps of the palace; or Mrs. Lovett’s cause for pause in telling Sweeney her real motives. Lady Bird isn’t as high-concept as many of Sondheim’s works, but there’s a piercing truthfulness to the film, and arguably Gerwig’s work in general, that makes its anxieties and tenderness reverberate in the viewer’s heart with equal frequency. Lady Bird, in spite of her glorious assertiveness, is ambivalent about everything: She doesn’t really like her given name, doesn’t really like her hometown but can’t stop appreciating its beauty, she’s not sure about her faith (she attends a Catholic high school), she’s dissatisfied with her (class) status amongst her friends and in life, even though she, as her “scary, but warm-hearted mother” Marion (Laurie Metcalf) would be quick to tell you, doesn’t necessarily have the work ethic to change things. Gerwig, and Ronan by turn, have an uncanny ability to present the bizarre, but quite common, state of mind that occupies the point of both contented satisfaction and complete dissatisfaction. Ronan is perfectly paradoxical in how self-assured she can be when approaching a boy or how disappointed she feels after she sleeps with someone for the first time. She, like all of us if not more intensely, feels things are going to be better on the other side of the proverbial fence. Always. It’s not insignificant, then, that the first boy we see her date, a tall, gangly Danny (Lucas Hedges), sings “Giants in the Sky” from Into the Woods for his audition, a song in which a young Jack (of the beanstalk sort) ruminates on the bittersweet nature of change and emotional maturity, the inability to have it both ways. Particularly of interest is Jack’s consideration of the home he never cared for in the first place: “The roof, the house and your mother at the door / The roof, the house and the world you never thought to explore.” It’s a hard song to sing, one that has notes that fly beyond the clouds and stoop as low as the roots of said stalk. Hedges does a lovely job, but the song’s preoccupations with “wish[ing] that you could live in between” may speak to Lady Bird as much as Danny’s loveliness. Lady Bird wishes so much to get out, to be in New York (“where there’s culture”) or at least Connecticut. But the way she knows the geography of her world—of her house and even of her body, Ronan casually sitting upside down watching TV or sprawled across the couch—suggests there’s as much affection as there is disdain for that world from which she so wants to get away. To be fair, Lady Bird feels trapped, cloistered in a space that feels small and insignificant at this moment in her life. Ronan’s delivery of “Everybody Says Don’t” from Anyone Can Whistle is razorlike, comparable to her wit and intellect, but it also expresses the deep frustration that beats within her. 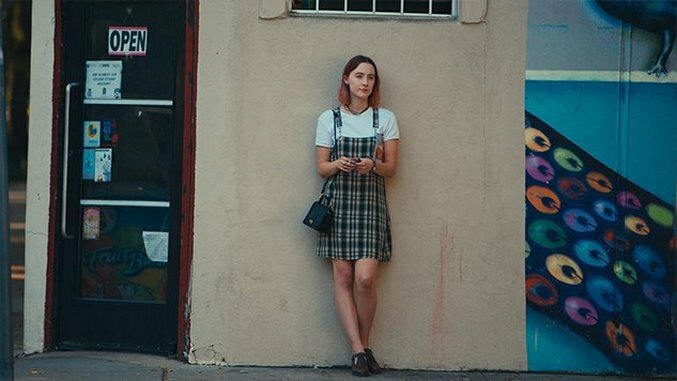 Her identity and presentation are built around her knowing what she wants, a self-possession that’s firebrand and a thrill to watch, but as Gerwig’s Frances Halladay turned as she did in Frances Ha, to the mirror with uncertainty lurking beneath her smile, so does Lady Bird, the same kind of unsureness occasionally permeating her eyes. What does the future hold for Lady Bird? Moreover, what does the future hold for her relationships, namely the one she has with her best friend Julie (Beanie Feldstein) and her mother? For Lady Bird and Julie, their friendship, well established by joint musical auditions, food sharing and inverted mathematical skills (in that Lady Bird has almost none), Lady Bird’s continual restlessness with her place in the world and access to the finer things in life begin to tear a hole in their dynamic. This forces Lady Bird to situate herself amongst wealthier people, further affecting her malaise. But it’s the relationship she has with her mother, Marion, that is the core of the film. All of the things that the film explores—class, femininity, closure, maturation—lead back to how she and her mother relate. The musical Lady Bird is in is the cult, play-maudit Merrily We Roll Along, its central idea about how people change/don’t change after school and disappointment in life. (Sensing a pattern?) Marion has already lived it, Lady Bird is just about to. Metcalf gives a performance that is breathtaking in its harshness and empathy; with immaculate precision she can swing a scene’s tone between tragedy and comedy. Marion reads as harsh, rough, but there is discernible love in her. The two, as Tracy Letts’ father describes, have “such strong personalities.” They’re unable to communicate, and the scars from that growing distance between them show in each characters’ movements and bodies. With regards to Lady Bird and Marion, the combination of Gerwig’s writing/directing and the leads’ performances is a dangerous cocktail, an explosion of overwhelming, finely tuned fury, frustration, elation, euphoria, disappointment and, yes, ambivalence. Letting go is something that both Lady Bird and Marion desperately want and don’t want and don’t know how to navigate the complexities of; letting go of pain is hard to do, this fact lining every piece of dialogue and every impressively edited and composed scene between the two. What happens when they finally have to? Lady Bird is nothing short of tremendous, a wise film about how two people deal with ambivalence. Without lettings its strings show or veering into bald-faced sentimentality, Lady Bird breaks the heart and lifts the spirit in miraculous ways. “All I wish is to know what I want,” utters Cinderella in Sondheim’s deconstructed fairy tale. As Lady Bird and her mother reflect on this, the film flies.